Does your little one fancy rubbing shoulders with the Teenage Mutant Ninja Turtles or posing for photographs with Dora the Explorer? What about having a splashing good time with SpongeBob SquarePants and getting drenched in green slime? 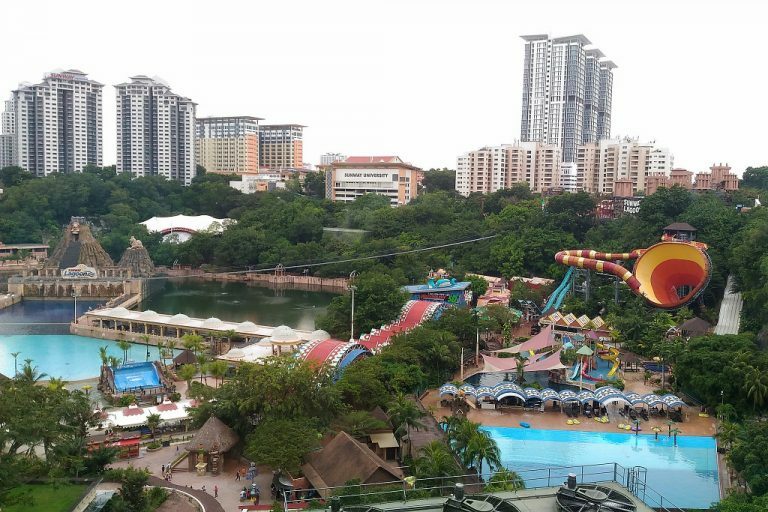 Then head down to Sunway Lagoon for your next vacation! 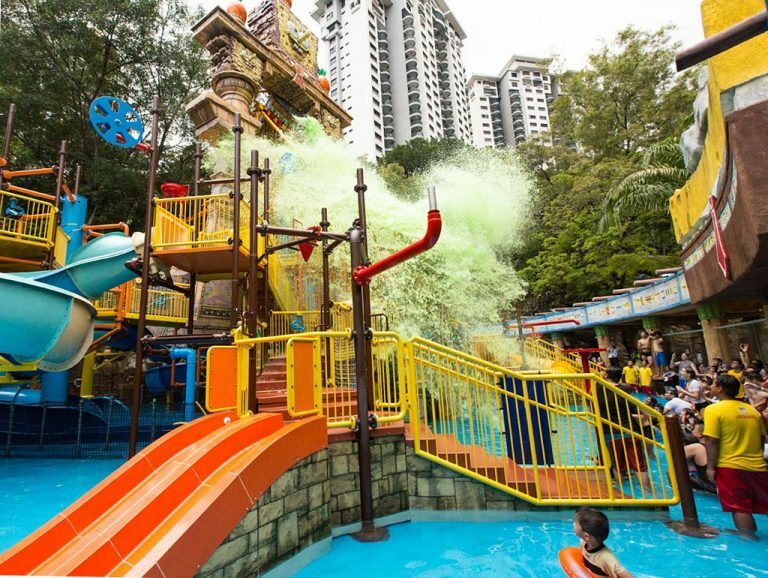 Home to Asia’s first Nickelodeon water theme park, there’s something for the whole family to enjoy at Sunway Lagoon in Petaling Jaya, Malaysia. In addition to Nickelodeon Lost Lagoon, there’s also a separate Water Park, Amusement Park, Extreme Park, Scream Park and Wildlife Park! When planning your trip, do study the park map for a comprehensive list of rides, activities and height restrictions. 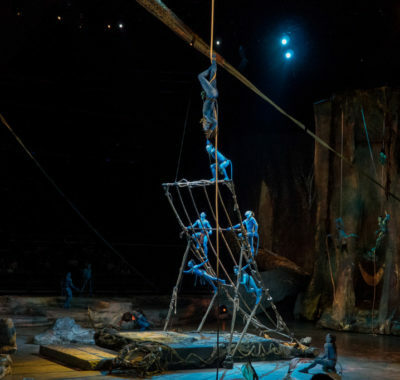 We checked out the various attractions and highlight some age-appropriate recommendations here. 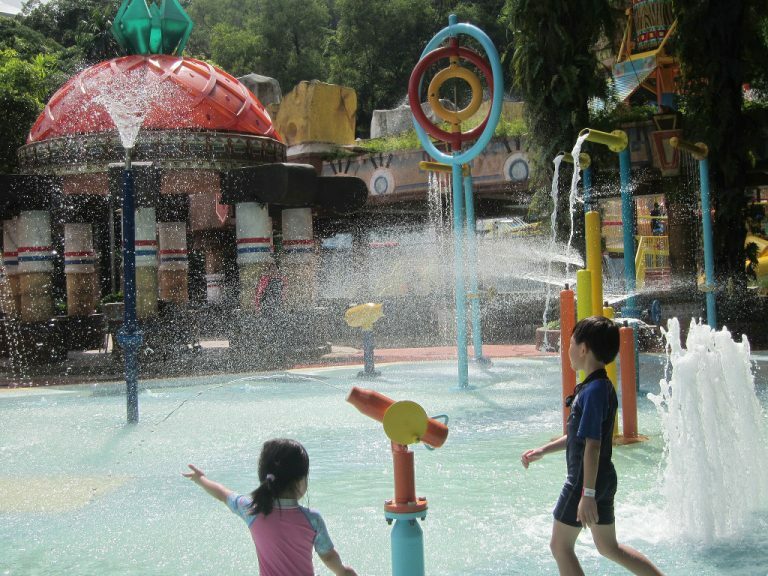 The good news is that children under 90 cm enjoy free entry to Sunway Lagoon. Although they cannot go on most rides due to the 1.1 m minimum height requirement, there are still plenty of activities to keep them occupied. Surf Beach is a great place for building sandcastles while watching episodes of Dora the Explorer on the big screen of Surf Stage. If you have older children who are playing on the bungee trampoline, you can also keep an eye on them from here. 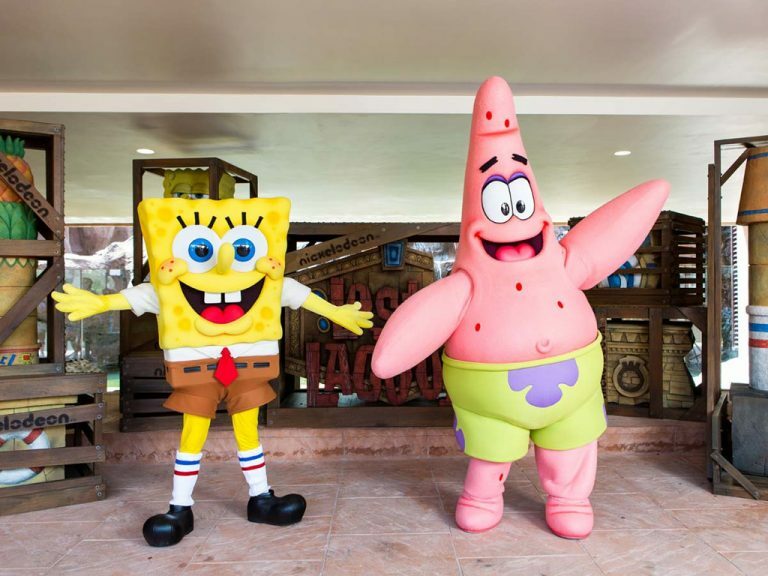 Located in the Water Park, Kalahari Kids and Little Zimbabwe are water playgrounds catering to the little ones who do not meet the 1.0 m height restriction for the higher slides at SpongeBob Splash Adventure. Be sure to wrap your child up snugly if you intend to continue your water play at Nickelodeon Lost Lagoon, which is a 10-minute walk away. Junior will have a splashing good time controlling the valves and adjusting the amount of water spraying out of the pipes at Splish Splash. They can even have a water fight using the water cannons there. While older siblings enjoy the water rides at Nickelodeon Lost Lagoon, the younger ones can follow rope bridges along the Explorers’ Trail. 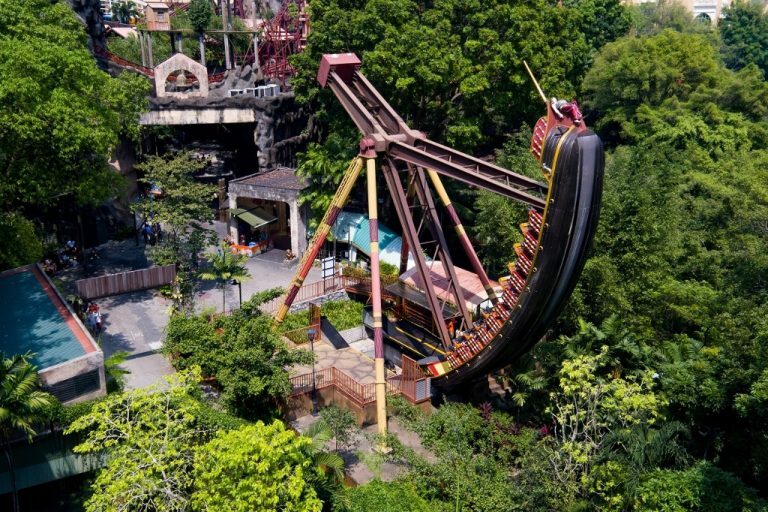 It’s set among treetops, allowing them to peek at the action taking place in the rides below. Just remember to use lots of insect repellent and be alert for biting insects. 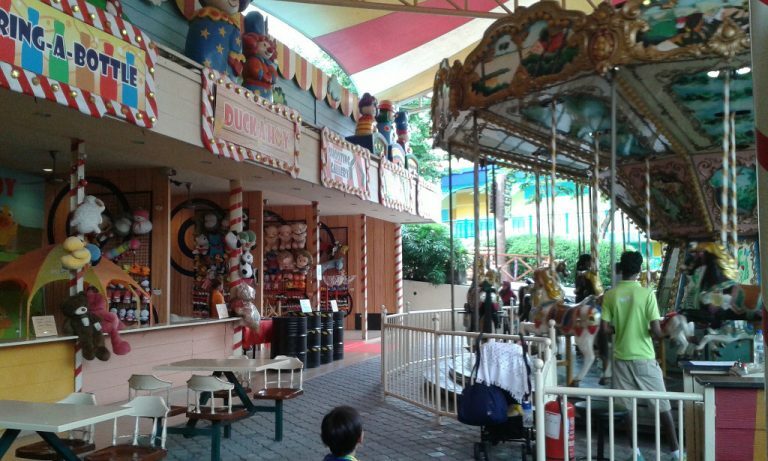 Although toddlers cannot experience the wet park rides, they can still enjoy some rides at the dry Amusement Park if accompanied by adults. The Vultures (a.k.a. aeroplane ride), Wagon Wheel (Ferris wheel) and Carousel are familiar fairground rides, while the Butch Cassidy Trail packs a far greater punch than your average merry-go-round. Those who prefer to keep both feet firmly planted to the ground won’t be left out. They can visit either the sheltered or outdoor candy-themed playground, or try their hand at some carnival games instead. 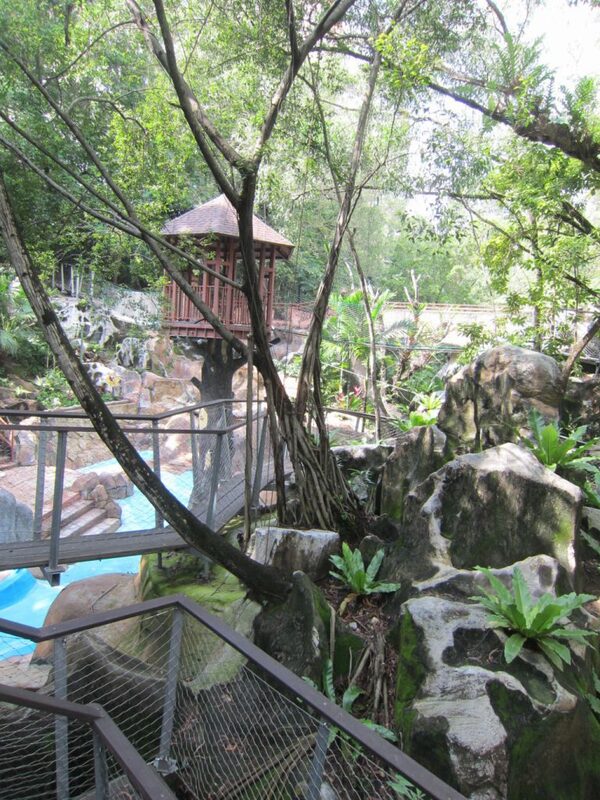 The Wildlife Park houses a mini zoo, an aviary and a pet village. Go on a Jungle Trail and discover animals native to the jungle, such as the hedgehog and lesser mousedeer. There’s even some exotic wildlife such as an albino lion and a white tiger! 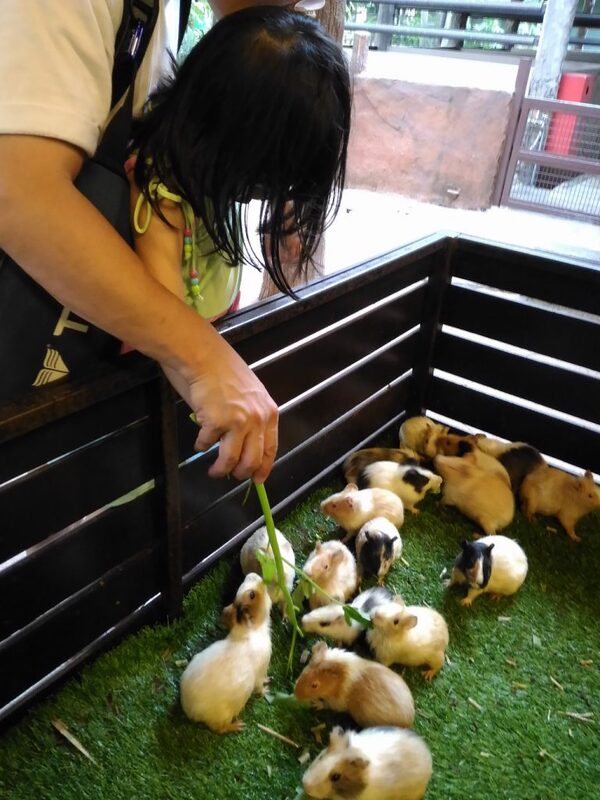 Little ones can feed and pat rabbits, guinea pigs and tortoises at the Pet Village or catch “longkang” (drain) fishes there. Check out the animal feeding times and shows here. The Ninja Turtles, Dora and Boots, as well as SpongeBob and Patrick Star, make regular appearances at the Lost Lagoon Podium. You’ll find it at the open area between Cubes Pizza and The Lost Raiders Store. Your child can take photos with them and get their “autographs” as well! Do check out the latest schedule that is displayed there, as it may differ from what is posted online. A schedule of dance performances can also be found here. 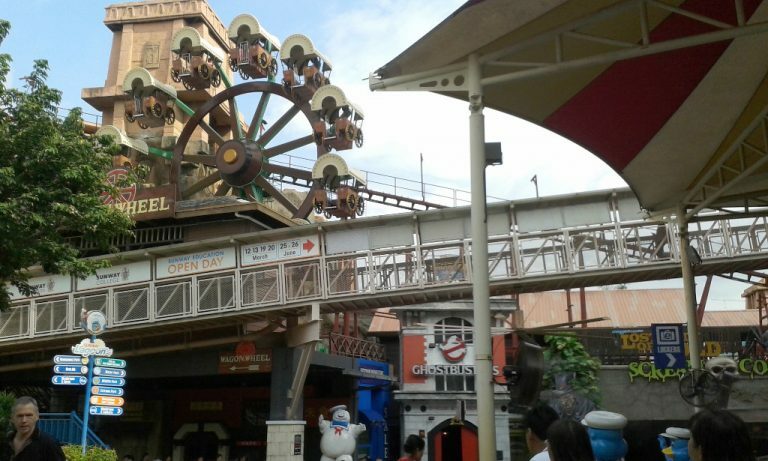 Sunway Lagoon was built in the crater of a disused tin mine, 150 feet below ground level. To get a feel of the size of this former tin mine, take a walk across the suspension bridge which links one end of the lagoon to the other. 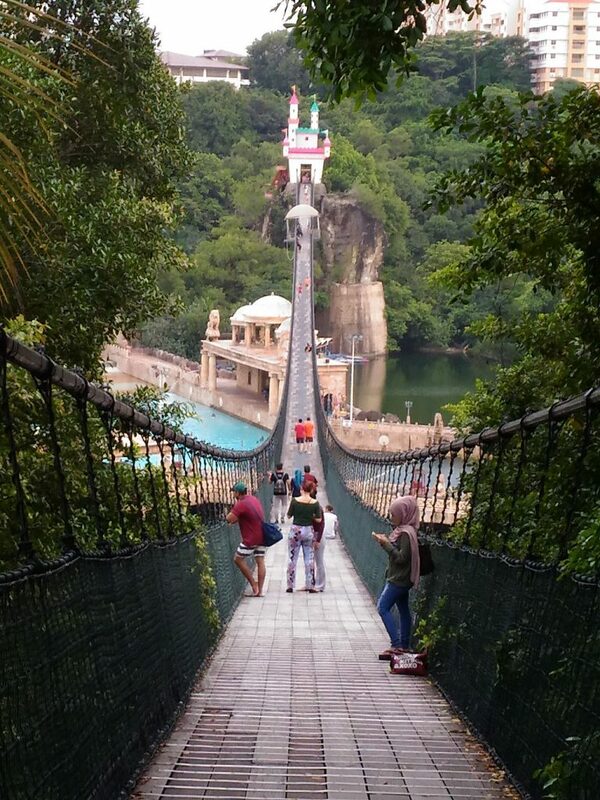 Pose for photos on the world’s longest pedestrian suspension bridge. 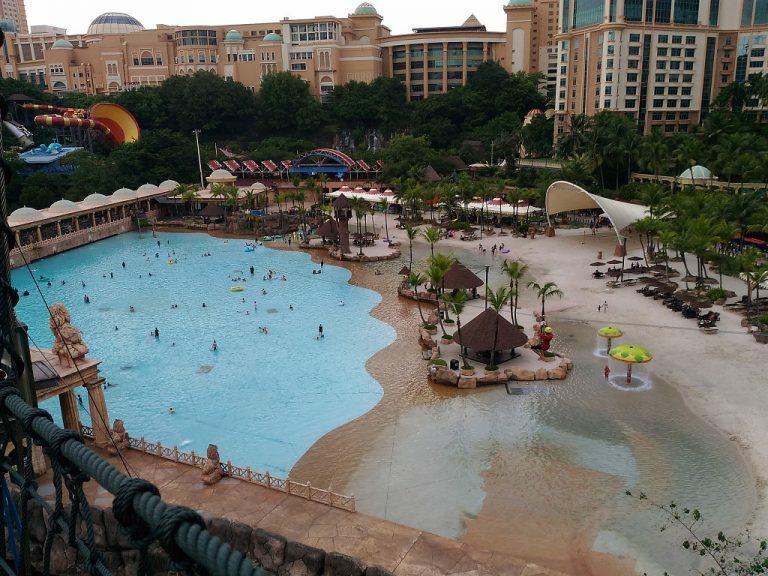 While you’re at it, look down through the grilles beneath your feet at the ant-sized people in the Water Park below! Take the escalators leading up from the Wildlife Park to access the bridge, as the other end is only accessible via a long climb up the stairs. If the little feet are tired of running around the theme park, simply hop onto this life-sized train. 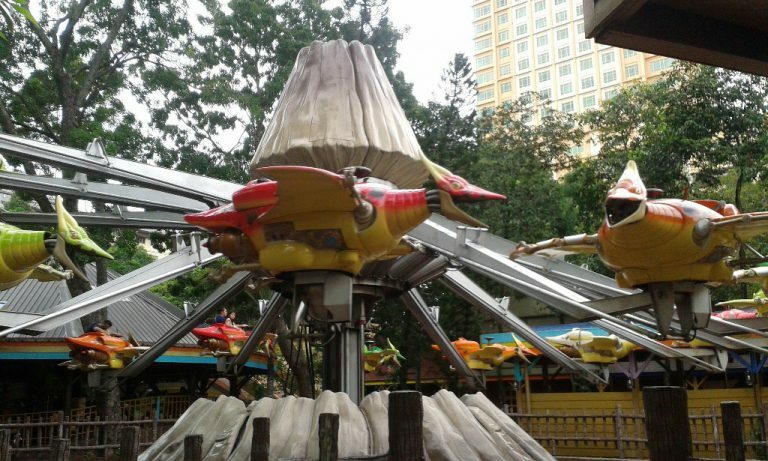 It runs at half-hour intervals and makes stops at the Water Park, Nickelodeon Lost Lagoon and Wildlife Park. This also provides a comfortable way of getting an overview of the entire park. In addition to the above-mentioned activities, children above 1.1 m are spoilt for choice at the wet and dry parks. 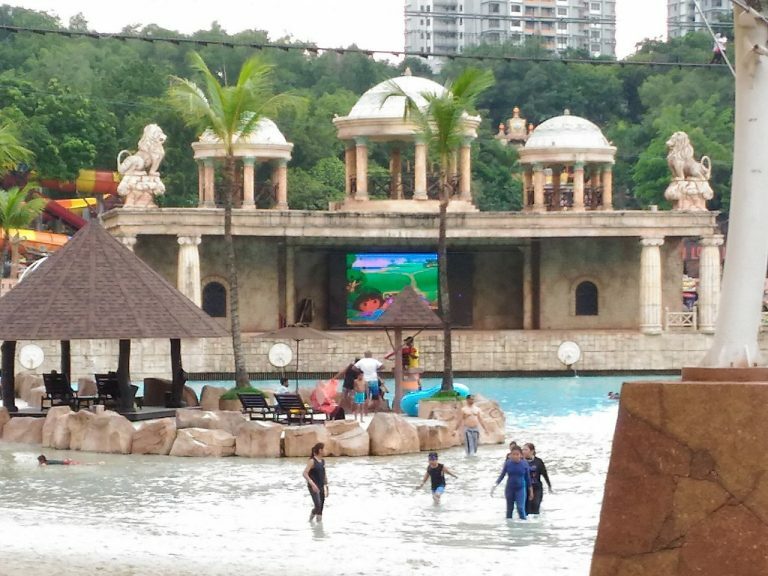 The water rides at the Water Park and Nickelodeon Lost Lagoon are arguably the main draw of Sunway Lagoon. 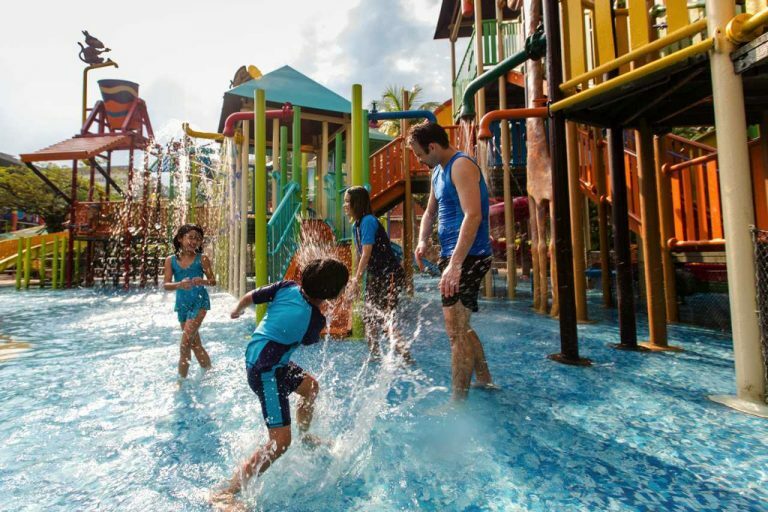 With the exception of the FlowRider, children above 1.1 m can go on any ride at the Water Park. 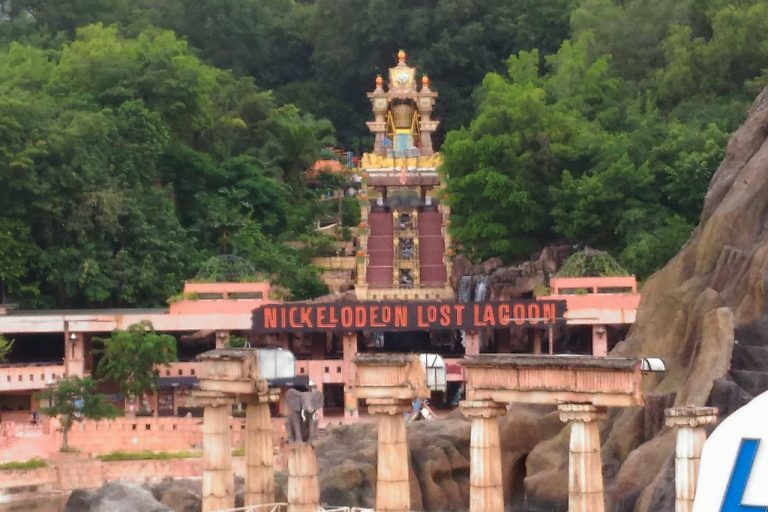 However, they need to be above 1.2 m to enjoy most of the rides at Nickelodeon Lost Lagoon. Station yourself at SpongeBob Splash Adventure at 4pm if you enjoy having green slime tipped on you! Be prepared for long queues at popular rides such as the Vuvuzela, the world’s largest vortex ride. Children can try their hand at archery, paintball target shooting or pedal boating at the Extreme Park. 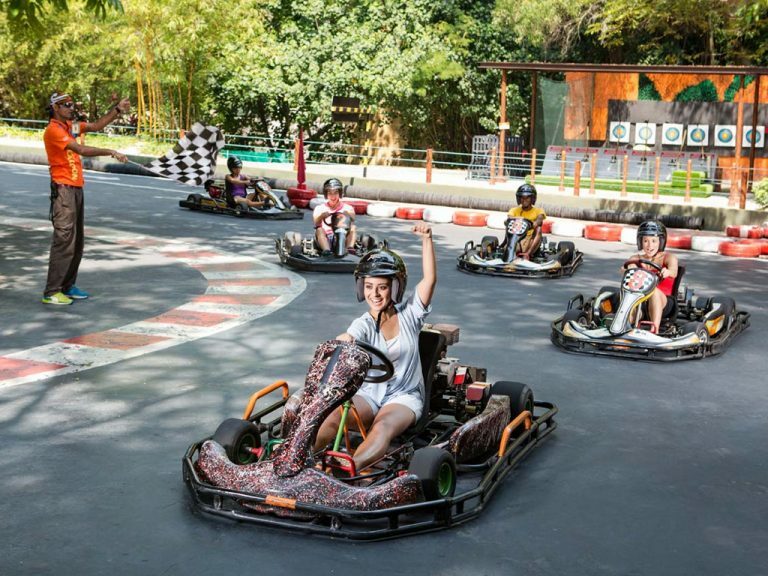 Those above 12 years old can also drive Go Karts (additional fees apply), All Terrain Vehicles, or go kayaking. Children who weigh more than 20 kg can also check out the bungee trampoline. Fancy a close encounter with zombies and inhabitants of the other world? Then venture into Horrorwood Studios at your own risk! Scream Park is open to children above the age of seven years. However, the macabre mannequins outside the building are an indication that parental discretion should be exercised here. While teens and above can take part in the same activities the kids can, there are a couple of things they can do that the younger ones will have to wait till they’re big enough to try. Rather than crossing the lagoon on the suspension bridge, adrenaline junkies who meet the weight requirement can zip across on the Flying Fox. For even more thrills, bungee jump (separate fees apply) from the bridge instead! Thrill-seekers above the height of 1.4 m can take a literal spin on the Tomahawk or Pirates Revenge (a Viking ship). Be prepared to be swung upside down on these rides! 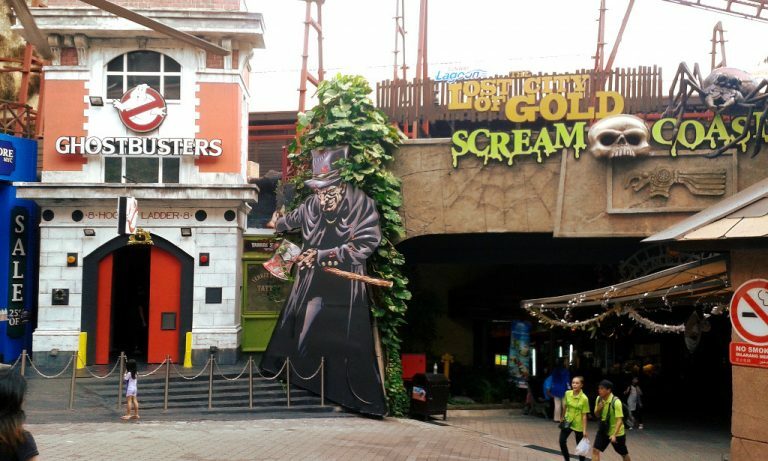 Those who prefer to remain upright can ride the Lost City of Gold Scream Coaster instead. After Sunway Lagoon closes at 6pm, you can head to the nearby Sunway Pyramid Shopping Mall if you still have energy to burn. There, your children can try their hand at bowling or ice skating, and you can indulge in some retail therapy. Or you can simply put your feet up and enjoy a nice dinner at the end of a long day. There are three hotels − the Sunway Resort Hotel and Spa, Sunway Pyramid Hotel and Sunway Clio Hotel − around the theme park. 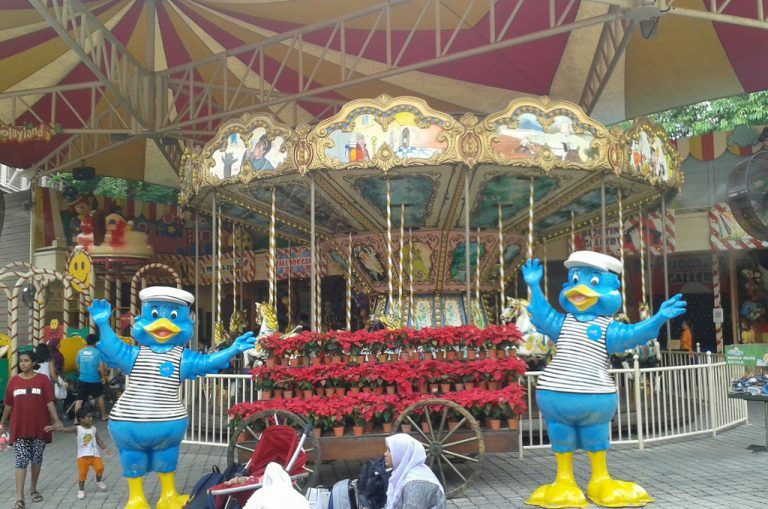 Do check out their packages, many of which include tickets to Sunway Lagoon. There are also budget-friendly boutique hotels in the Bandar Sunway township within walking distance of Sunway Pyramid. 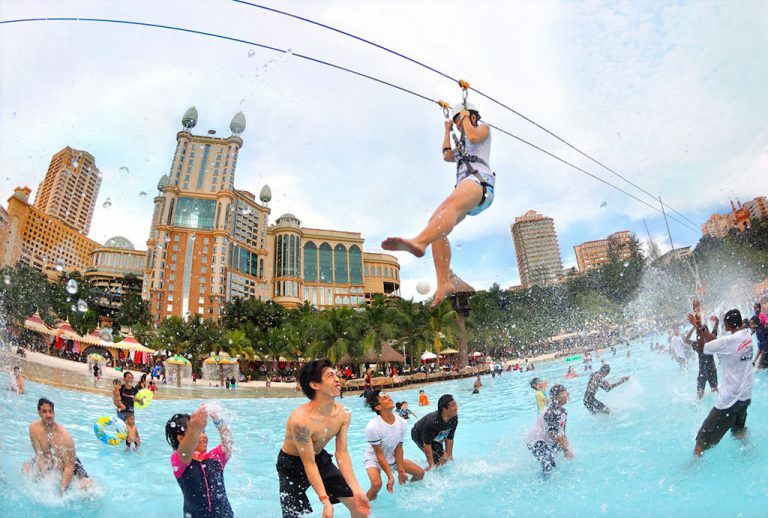 Sunway Lagoon enforces a strict policy of not allowing outside food or drinks to be brought in (bags will be checked!). As re-entry into the park is not permitted, be prepared to refuel at the food kiosks or fast-food restaurants within the theme park. After park hours, you can head to the nearby Sunway Pyramid, where you will find a food court and an array of restaurants. Alternatively, you can check out the local fare within the vicinity of Sunway Pyramid. 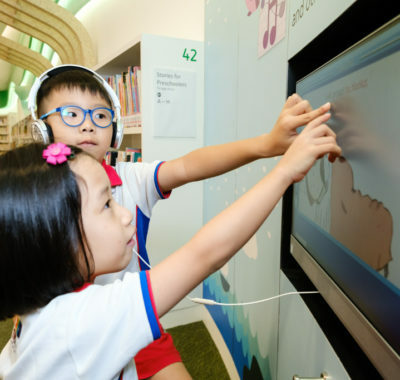 Do check out the latest school holiday promotions and Wildlife Adventure EduHunt with prizes to be won. 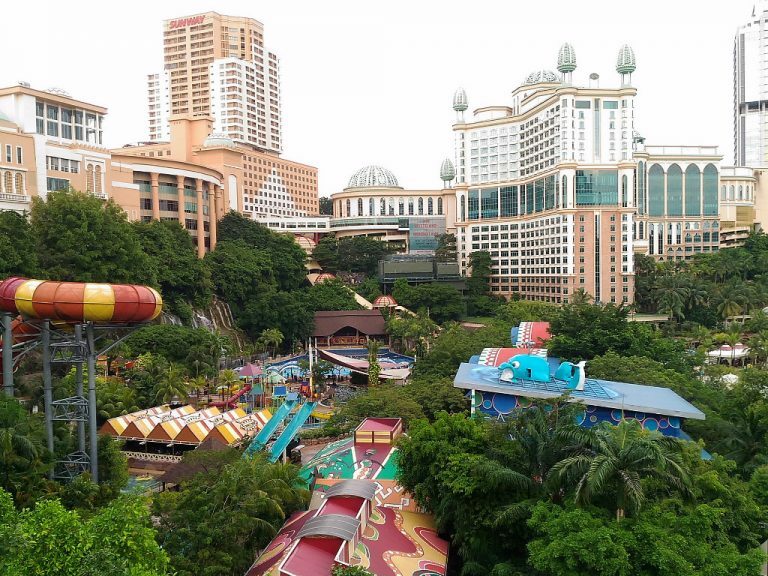 By air: Sunway Lagoon is a 35-40 minute taxi ride from Kuala Lumpur International Airport. A metered taxi ride costs approximately MYR80. By coach: It takes approximately 6-7 hours to travel from Singapore by coach. Several coach companies have drop-off points at Sunway Pyramid or Bangsar, which is a 10 minute taxi ride away. 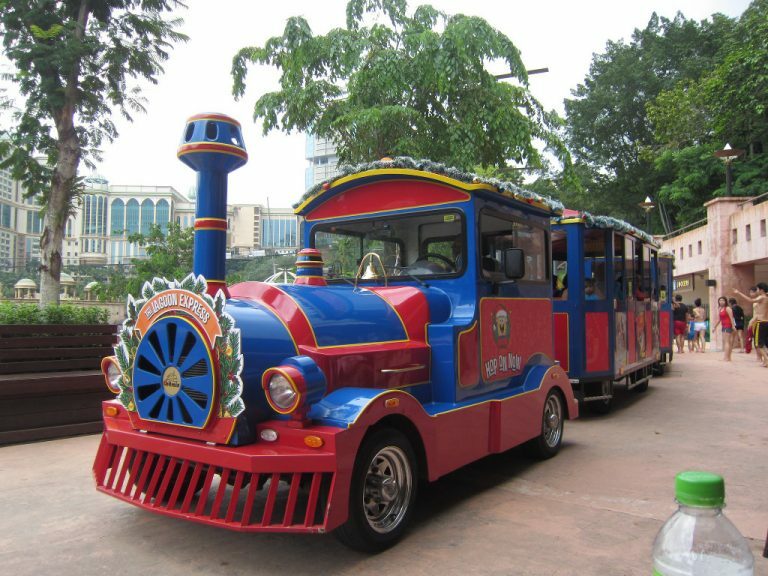 By car: Sunway Lagoon is a 15 minute drive from KL city centre. Directions and maps are available here. By public transport: RapidKL Bus T770 plys the route from the bus stop at Subang Jaya KTM-LRT interchange station (along the KTM Port Klang Line) to Sunway Pyramid. Alternatively, travel to either Setia Jaya station (along the KTM Port Klang line) or USJ7 station (along the Kelana Jaya LRT Line). From there, transfer to the Bus Rapid Transit and alight at the Sunway Lagoon station. These lines are reflected in the Klang Valley Integrated Transit Map. Mother’s Day Giveaway: 2D1N Staycation at Amara Singapore for a Family of Three (worth $258++)!